Here are some new features available in version 18. 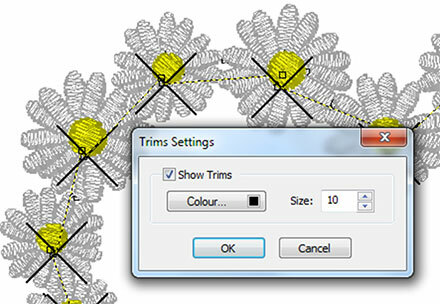 Our new 'Trims tool' displays the location of any trim functions on the design via a black cross. The cross can be configured, enabling you to adjust the size and colour. A Quick Font tool is now available, it enables a character that has been typed out and edited, to be stored in a Quick Font that can then be used again within the design. It is easy to insert Symbols and Foreign Characters, using our quick access chart. With the Thread Palette Editor form, numerous Colour Palettes can be created for a design, you can switch between the Colour Palettes/Colourways for that design. There are 7 new Satin Fonts.